The Milwaukee County Zoo is excited to announce the birth of two new red kangaroo joeys. Both joeys were first seen in late March when their mothers were being given vaccinations. The first joey, a female, was born to first-time-mother Anastasia. 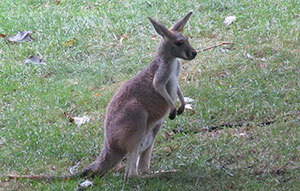 This joey has been venturing out of her mother’s pouch for the last few weeks. Both Anastasia and her joey have been very relaxed since the birth. The joey has been seen grazing on grass in her outside yard, but she has yet to take to the pellets and fruits and vegtables that make up our red kangaroos’ diets. She will remain at the Zoo into adulthood since we do not have a related male in the group. This joey has not yet been named. A second joey was born to first-time mother Ama. This joey is still in Ama’s pouch, but its head has been seen peeking out, and it will be venturing out of the pouch soon. The red kangaroo is the world’s largest marsupial. At birth, the joey immediately climbs into its mother’s pouch and doesn’t emerge for about two months. It will spend time in the pouch until it reaches about eight months old. As a joey grows, its head and feet can be seen sticking out of its mother’s pouch. Red kangaroos live throughout western and central Australia. They can hop along on their powerful hind legs at speeds up to 35 mph. Females are smaller, lighter, and faster than males. Males are stronger, and will often use their strength to compete for potential mates.